Everyone thinks they know Hillary Clinton. Lucas Hnath’s Hillary and Clinton, now playing at Second Thought Theatre through February 3, re-introduces the famous figure as a woman named Hillary running for president of a country called the United States of America in January 2008 in an alternate universe. The characters have familiar names, but this play is not about the reviled and revered woman as portrayed in the media. 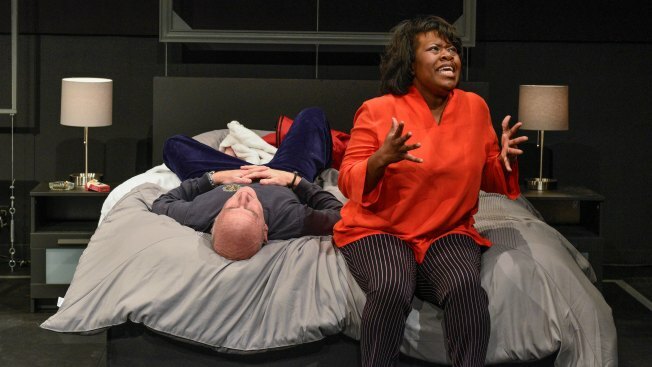 “Taking a moment to step away from her policy positions which this play doesn’t really address, step away from her political image which beyond her campaigning we don’t dive into in this play, we get to see her on a human level as a person in a hotel at 2 a.m. talking to her husband,” Laura Colleluori, the director of Second Thought Theatre’s production, said. Hnath’s play approaches Clinton’s story much as Shakespeare approached historic figures like Henry V or Richard III in his history plays. Actors do not need to look like their historic counterparts and during the 2016 production at Victory Gardens Theater in Chicago, Hnath asked the actors to put aside a 74-page packet of biographical information about the Clintons. “Yes, we have all of this information about their actual life, but we want to approach it textually. What does the script tell us about them and let’s build a character based on that first and not based on our knowledge of them in our world, especially our assumptions about them,” Colleluori said. Letting go of previous knowledge was a challenge for Stormi Demerson, the actor playing the candidate. “It’s finding a delicate balance to staying true to how she would act as a candidate and how she is as just a woman and how she would relate in different experiences and different situations,” Demerson said. An actual occurrence helped Demerson develop the character. A moment where Clinton became emotional during her 2008 campaign is mentioned in the play and Demerson used it as window into the character’s psyche. In creating this role, Demerson stepped into the shoes of a woman who has been in the public spotlight for decades and must constantly worry about how she presents herself. Demerson used the script’s description of her character as “weird and wooden” to physically shape her performance. “To find that within my physical body and the body of the character to make that connect to her as a person,” Demerson said. Navigating a world where a woman is judged by how she measures up against other people’s expectations is what Demerson thinks most women will understand. Colleluori and Demerson emphasize this play is not just for people who voted for Clinton. “I really hope that people who are not Hillary supporters, not Democrats, not leftists would come and see this play. I think the play speaks against the ideas and ideals that certain groups had against Hillary. I think it would diminish whatever thoughts or negative preconceived notions they had about her. I think they would be able to relate to her on a human level,” Demerson said. “Theater and democracy were started in the same place, in the same decade because they both demand the same thing which is that we care about one another’s experience. We need work that demands we care about experiences of people might not agree with,” Colleluori said. Knowing Clinton is a fan of theater, Demerson thinks Clinton would appreciate the show. Performances are at Bryant Hall on the Kalita Humphreys Campus.